It makes the violin feel much more secure than my other one. Mr. Olson's knowledge of body-mapping plus his determination to solve his own playing discomfort led to the extensive research and development of this remarkable chin rest. The WAVE is so well thought-out according to how the body is structured and works best that every upper string player who has experienced a painful “set-up” will want to try this! The WAVE chinrest has really improved my level of comfort when practising and performing as a professional Violist. The WAVE chinrest is a wonderful addition to the violin community. Beautifully crafted and ergonomically correct for optimum playing comfort, the WAVE has alleviated painful playing for many students and professionals. I've included the WAVE chinrest in my Grossman Method workshop and teacher training sessions, and the WAVE chinrest has generated much excitement. Thank you Randy! Thank you so much for the WAVE. The chinrest you have designed is brilliantly functional and beautiful to look at. Randall Willis Olson has designed a chinrest that is more comfortable than the styles currently available. It follows the bone structure of the face, giving smoother contact for holding the instrument. Students and professional players alike will enjoy use this new design. Today I had the opportunity to try out the WAVE, which is a revolutionary new chin rest invented by Randall Olson. Now I own one! No more struggling with poorly fitted chin rests. I perform my violin with ease and comfort! The WAVE is such an exciting invention! It is shaped so that all you have to do is keep your head straight and make a slight turn to the left with your head. I can see how the WAVE will revolutionize the world of violin playing. Everyone should own one! This is great. I found my head balance through Alexander Technique, but was unable to apply that to the violin because the chinrest kept forcing my head out of position. Now my head simply swivels to the left and the chinrest truly supports it. Also, I like a low violin position, and with the highest setting I don’t have to force my head down in order to meet the chinrest. Upon seeing Randall Olson's chinrest, I was immediately intrigued, because I'm a professional violinist who plays a lot and am always in the market for things that make the physical part playing easier. Because the surface of the chinrest that comes in contact with the jawbone is longer, it helps distribute the weight of the violin, thus making it easier to hold the violin up. Building a solid-body instrument radically alters the balance point of the violin, and I have struggled for years to find a suitable chin/shoulder rest combination that is both comfortable and playable. The WAVE chinrest does exactly that. Its extended contour and shape provide the extra leverage needed to balance the electric violin without putting any extra stress on my neck or shoulder. Even after hours of practicing or performing, I put the violin down and hardly notice it was there! As a professional conductor who has led orchestras for nearly fifteen years, I have observed first hand how long rehearsals can take their toll on violinists. It seems that no one has been able to design a chin rest that works with, instead of against, the human physiology of playing the instrument...until now. Randall Olson's ergonomically designed chin rest, The WAVE, maximizes the potential of playing the violin comfortably. Students and professionals alike will benefit from his creation. When my students started coming to rehearsals with the WAVE on their instruments, I was puzzled as to its function. Then I tried it and became an instant believer in its benefits. My students who use it have greater comfort, better posture, balance, and ease of playing. The results, physical and musical, have been remarkable. I recommend to all my students that they try the WAVE. They will love it. I find my WAVE extraordinarily comfortable- it feels as if it's hardly there, and I love the Padauk wood. It's so light and really great to play on, and I do think it adds to the resonance of the violin. 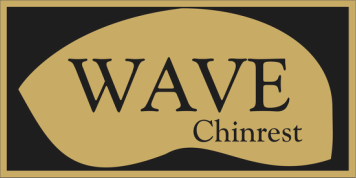 The WAVE chinrest allows the player to correctly position the shoulder, arm, and back in a comfortable form, and it works to reduce errors in stance, body position, and balance. This valuable solution positions the body correctly, providing optimal balance and distribution of weight to the feet. I like it! I love it! I could take a nap on this chinrest! It makes me feel happy. It makes we want to practice. My old one feels worse. By far worse. I felt like my head was tipping forward way too much. This is much better. I feel like it's not even there. The commercial ones cut into my jaw. I'm not even paying attention to this chinrest; I'm paying attention to the music. It's a miracle! My head feels so nice and light, I feel like a violin model! I don't ever want my old one again. This one is more natural, more comfortable, and lets your head lie in the correct position. With my other rest, I felt as if the violin was slipping down my shoulder and that the rim pushed into my jaw. With this one, I finally feel comfortable with my violin.